In Full Strength Competition the player can participate in a strongman competition, basically weightlifting with uncommon challenges. 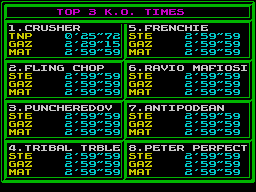 The player can choose between six real-life athletes (Magnus Ver Magnusson, Flemming Rasmussen, Riku Kiri, Wayne Price, Heinz Ollesch and Manfred Hoeberl) and during the competition all six disciplines are played one after another. Whoever gathered the most points at the end of the day can call himself Strongman Champion. The events are:Truck Pull (pulling a truck) and Farmers Walk (walking with a dumbbell in each hand): Pressing the left and right arrow keys as fast as possible. Keg Toss and Tire Toss (discus throwing with kegs respectively tires): Pressing the left and right arrow keys as fast as possible and then the space bar to throw. Atlas Carry (hauling boulders): Pressing the left and right arrow keys in the right rhythm to keep the balance. Showgirl Lift (lifting girls who are sitting on a platform) and Car Roll (flipping cars over): Pressing the space bar to stop a symbol at the middle of a horizontal bar.